Pass & Seymour Straight blade duplex receptacle in gray color, has a unique design with impact-resistant nylon face and PVC back body construction for long-life durability. 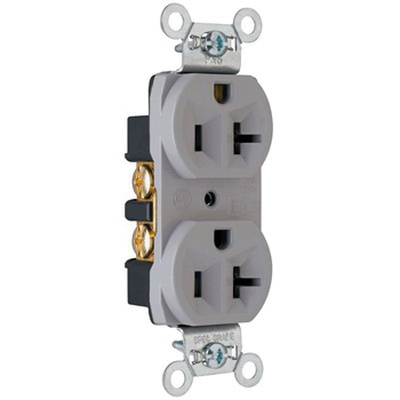 This 2-Pole, 3-Wire receptacle features corrosion-resistant, 0.042-Inch zinc plated and tabbed steel strap and triple-wipe brass contacts for lasting retention. It operates at a voltage rating of 125/250-Volts AC, current rating of 20-Amps, temperature rating of -40 to 60 deg C and dielectric strength of 2000-Volts. It includes break off, line-contact connecting tab for easy split-circuit wiring. It has stainless steel auto ground clip and internal screw-pressure plate back wire. It is suitable for education, institutional, hospitality/lodging, retail, multiple dwelling and office. The straight blade duplex receptacle meets RoHS, UL, File Number E140596, Standard UL498, Federal Specification WC596, CSA/CUL, File Number LR16063 and CSA C22.2 No. 42 standards.